1) Letter of Authenticity, printed on original 1960 deckle-edge linen Allakazam letterhead. It is verified and personally signed by both Mark Wilson and Nani Darnell Wilson. And, can be personalized if that is your wish! 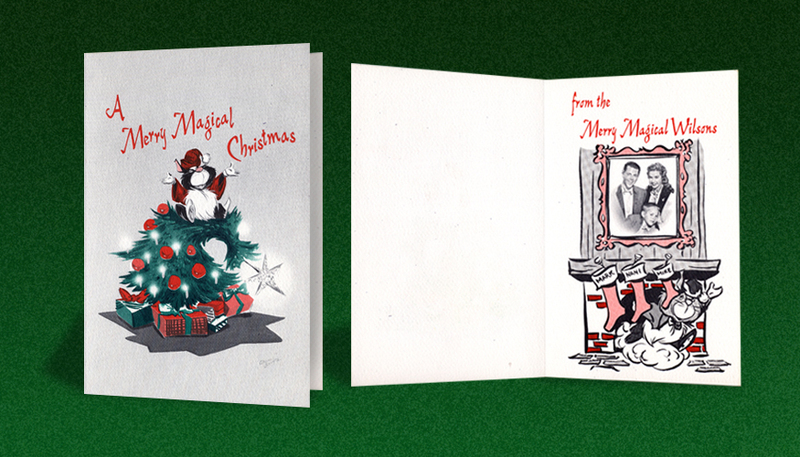 Three versions of the 1957 “Presenting” card printed on 8.5”x11” heavy linen stock and folded in half into a 5.5”x8.5” card. 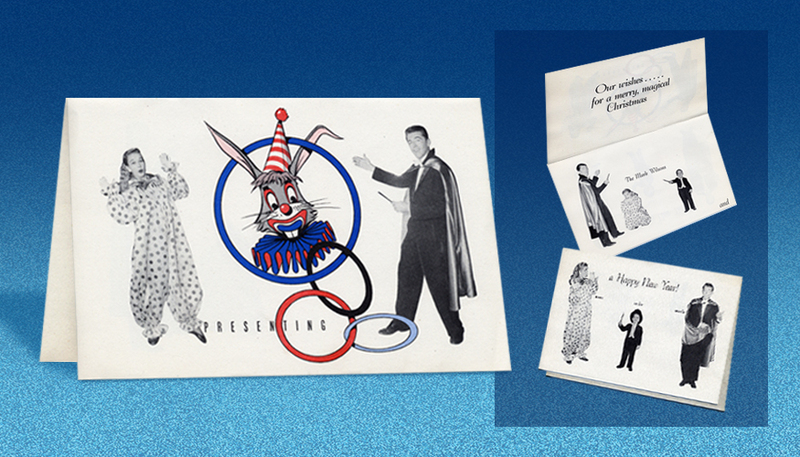 3) The original 1957 “Presenting” card with “Mortimer the Rabbit” clown head cover, not personalized, but has Mark and Nani’s photos on the front, inside and back. 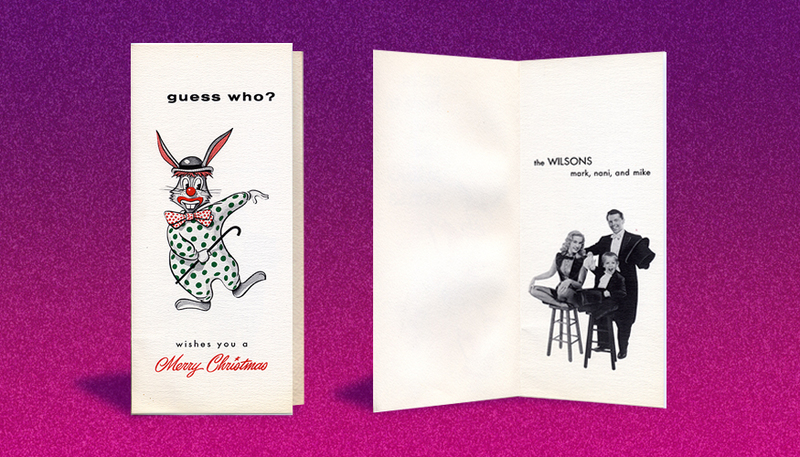 4) The 1957 Christmas and New Year’s card, with greetings and Mike Wilson’s photo added to the inside and the back. 5) 1957 MW Christmas Magic Party advertising card with Christmas show ad copy inside and recent '57 appearances listed on the back. 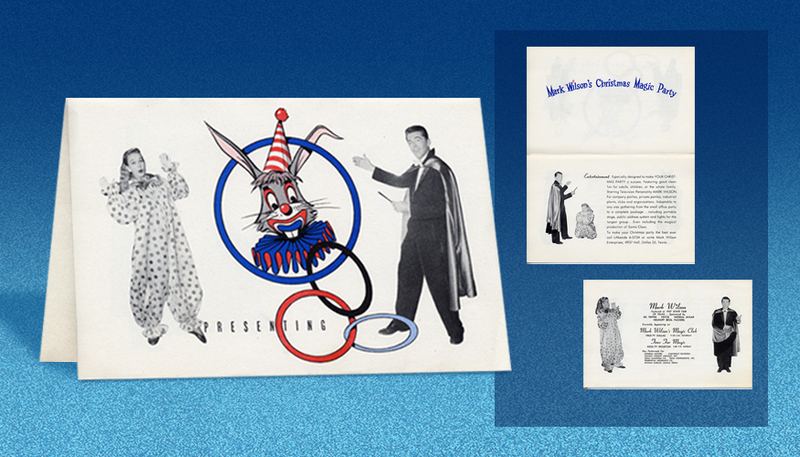 6) 1958 “Mortimer the Rabbit” as Santa, “Magic Words” card, printed on linen card stock folded vertical to 4”x9.25”, with a photo inside of Mark in his silver tux coat, Nani, and Mike in clown costumes. 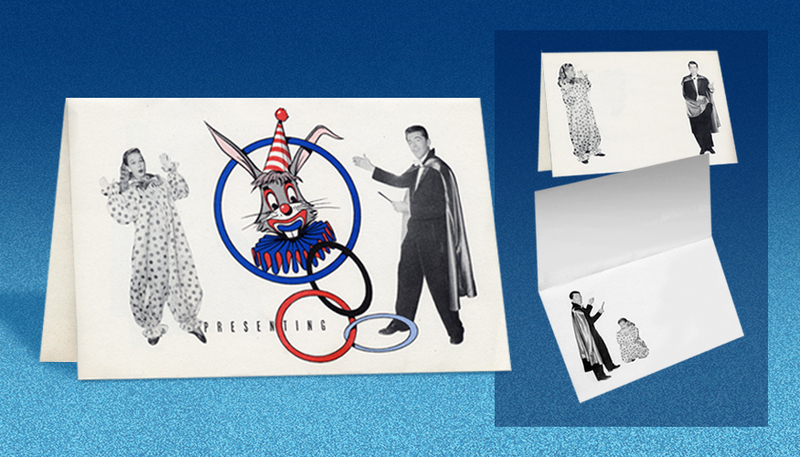 7) 1959 “Mortimer the Rabbit” as a Clown (with green polka dots), printed on linen card stock folded vertical to 4”x9.25”, with Mark, Nani, and Mike’s photo on the inside wearing their tuxedo costumes. 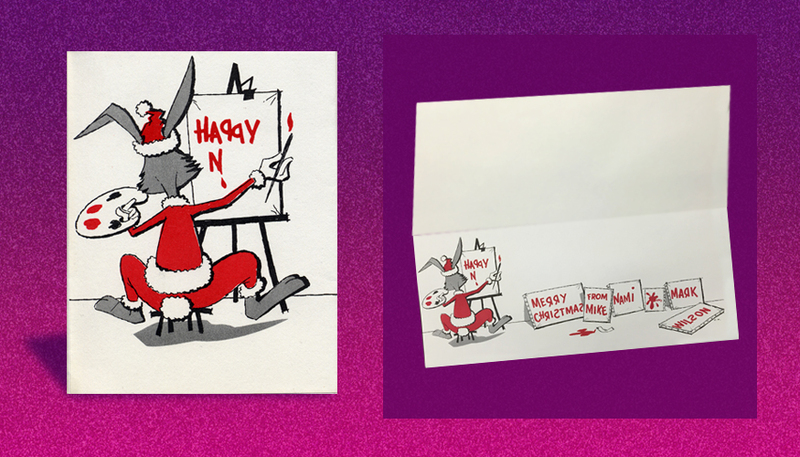 8) 1960 “Basil the Baffling Bunny” Merry Christmas card, printed on linen card stock folded horizontal to 8.5”x3.75”, Original Basil character art by Glenn Schmitz, with additional art and a CBS network studio photo of Mark, Nani, and Mike on the inside. 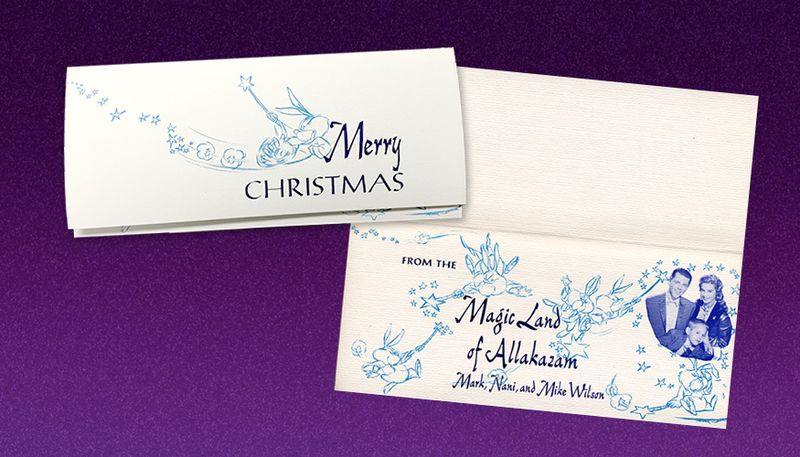 9) BONUS - Original matching custom Allakazam Stars Christmas Envelope! 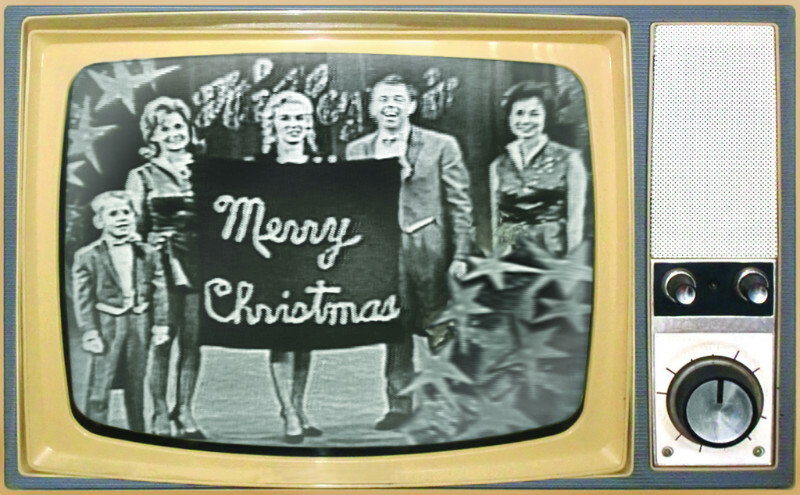 10) 1961 “Basil the Baffling Bunny” Merry Magical Christmas w/ Tree card, printed on linen card stock folded vertical to 5”x8” with additional art of the Christmas stockings hung at the fireplace, and photos of Mark, Nani and Mike inside. Complete with descriptions based on Mark and Nani’s personal memories! Presented in a beautiful archival album to preserve the collection. ​Exclusive Priority "FIRST" Notice for upcoming “Allaka-Treasures” as they are discovered, before they are offered to anyone else! It's our way to say thank you for your support and love for the Allakazam Archives Project! Purchases handled through the secure Paypay system. Only a couple left, get yours now before they are gone forever! Just click on the Buy Now button, Please. I am happy to help fill in any details about this offering.